Relax with a cocktail or coffee in the hotel’s Liquid Lounge. It’s a cosy spot with a live pianist adding to the mood. Wireless internet access is on hand too. Thai food is famous across the world. You can sample some of the nation’s typical dishes in the Tiffin restaurant, as well as high-quality Indian dishes. If you prefer, Western options are served. 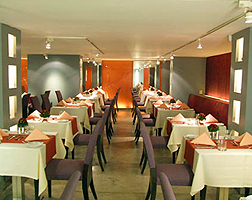 Enjoy your breakfast, lunch or dinner in the Tiffin restaurant’s cool and serene setting.